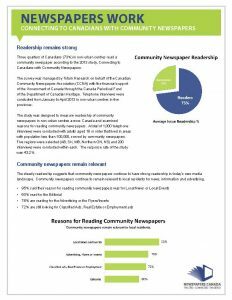 Three quarters of Canadians (73%) in non-urban centres read a community newspaper according to the 2013 study, Connecting to Canadians with Community Newspapers. The survey was managed by Totum Research on behalf of the Canadian Community Newspapers Association (CCNA) with the financial support of the Government of Canada through the Canada Periodical Fund of the Department of Canadian Heritage. Telephone interviews were conducted from January to April 2013 in non-urban centres in five provinces. 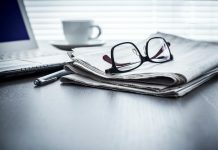 The study was designed to measure readership of community newspapers in non-urban centres across Canada and examined reasons for reading community newspapers. 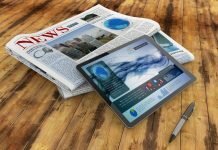 A total of 1,000 telephone interviews were conducted with adults aged 18 or older that lived in areas with population less than 100,000, served by community newspapers. Five regions were selected (AB, SK, MB, Northern ON, NS) and 200 interviews were conducted within each. The response rate of the study was 43.2%.